Helena Bay Lodge, Northland New Zealand’s new luxury beachfront property, is delighted to announce that it has joined renowned international hospitality association Relais & Châteaux. 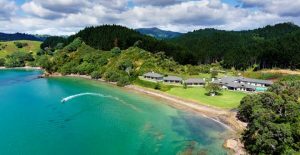 Opened November 2016, Helena Bay Lodge is an intimate beachfront retreat tucked along two miles of pristine, private Northland New Zealand coastline. The new, boutique property offers suites with balconies set right along the banks of the beach, delivering unobstructed views of the vivid, forest-framed and glistening Helena Bay cove; and a natural soundtrack of gently crashing waves. Nestled amongst 800 acres of divine, untouched greenery and peaceful shores, the lodge offers ultimate exclusivity paired with cuisine from the team of Michelin-starred Don Alfonso 1890 in Italy, at onsite restaurant Don Alfonso at Helena Bay. The lodge’s world-class kitchen serves nightly degustation menus blending classic Italian traditions of the Sorrento peninsula and Amalfi Coast with coastal New Zealand influences, made with ingredients freshly sourced from on-property farms, gardens and orchards. When not enjoying curated fine dining, luxurious accommodations and unbelievable views, guests can visit the opulent European-style spa for a massage, or seek out adventure on stand-up paddle boards or electric bikes. Helena Bay Lodge, which was recognized among the top new hotels globally in its debut year by Conde Nast Traveler’s “Hot List” and Travel + Leisure’s “It List” joins more than 540 of the world’s top rated, luxury boutique hotels and restaurants as part of the Relais & Châteaux brand. Fellow New Zealand members of Relais & Châteaux include: The Lodge at Kauri Cliffs, Huka Lodge, The Farm at Cape Kidnappers, Wharekauhau Country Estate, Otahuna Lodge and Matakauri Lodge.